Take a stroll downtown Kalispell and visit the revitalized stores and restaurants! 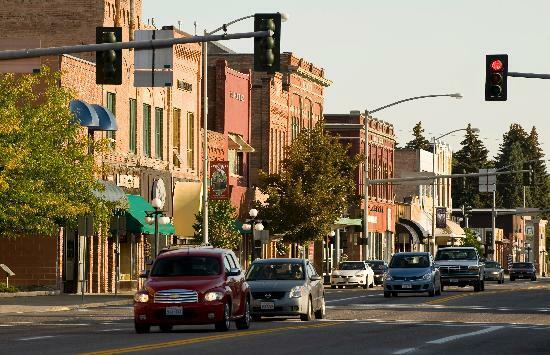 Kalispell, Montana lies in the heart of the Flathead Valley and north of Flathead Lake and plays host as the seat of Flathead County and most commercial amenities and development including a strong Kalispell Chamber of Commerce. Centrally located to the Flathead Valley’s recreational hot spots, Kalispell is 31 miles from Glacier National Park Come enjoy the Montana-style hospitality, old west atmosphere and recreational adventures that abound in the Kalispell area. If you crave culture, take advantage of Kalispell’s museums, retail shops and galleries. Nearly two-dozen galleries and studios provide cultural nourishment. The Central School Museum hosts exhibits significant to Kalispell’s historical background – built in 1894, it was Kalispell’s first school. The Hockaday Museum of Art, located in the 1903 Carnegie Library, is a nonprofit community art center and museum. Exhibits include both historic and contemporary works with emphasis on Montana art. The museum also offers classes, lectures and arts projects such as the “Arts in the Park” festival. The public library on 1st St East is huge and recently won as most innovative library in Montana! The highly recognized Glacier Symphony and Chorale performs year-round, often sharing the stage with world-renown guests. Nine schools make up Kalispell District 5. For quicker, lunchtime fare there’s Norms News which will take you back in time to a 1950’s soda fountain. While you are waiting for your burger and shake you can wander through 700 kinds of candy. Drive-thru only folks will love Frugals at the south end of town.